The gradual loss o aw Vichy territory tae Free Fraunce an the Axis pouers. Legend. Paris remained the formal caipital o the French State, althou the Vichy govrenment never operatit frae thare. 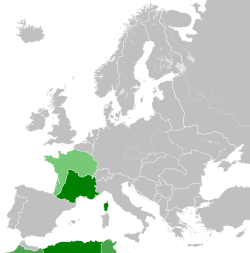 Althou the French Republic's institutions war offeecially maintained, the wird "Republic" never occurred in ony offeecial document o the Vichy govrenment. Vichy Fraunce is the common name o the French State (État français), follaeing its relocation tae the toun o Vichy, heidit bi Marshal Philippe Pétain frae 1940 tae 1944 during Warld War II. ↑ "Ordonnance du 9 août 1944 relative au rétablissement de la légalité républicaine sur le territoire continental – Version consolidée au 10 août 1944" [Law of August 9, 1944 Concerning the Reestablishment of the Legally Constituted Republic on the Mainland - Consolidated Version of August 10, 1944]. gouv.fr. Legifrance. August 9, 1944. Archived frae the oreeginal on 2009-07-16. Retrieved 2015-10-21. Article 1: The form of the Government of France is and remains the Republic. By law it has not ceased to exist. Article 2: The following are therefore null and void: all legislative or regulatory acts as well as all actions of any description whatsoever taken to execute them, promulgated in Metropolitan France after 16 June 1940 and until the restoration of the Provisional Government of the French Republic. This nullification is hereby expressly declared and must be noted. ↑ Dompnier, Nathalie (2001). "Entre La Marseillaise et Maréchal, nous voilà ! quel hymne pour le régime de Vichy ?". In Chimènes, Myriam. La vie musicale sous Vichy. Histoire du temps présent (in French). Bruxelles: Éditions Complexe – IRPMF-CNRS, coll. p. 71. ISBN 2870278640. This page wis last eeditit on 8 Januar 2017, at 21:01.